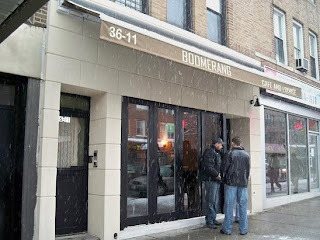 Boomerang, the casual cafe and watering hole of Astoria's international crowd has reopened its doors. Its entire look is more modern and contemporary, not differentiating itself too much from its 30th Avenue neighbors. But when it comes to patrons, its homogeneous look doesn't seem to matter--their loyal following of mostly young and middle-aged men has begun to pour in and congregate in the newly refurbished cafe. I don't know that the menu has changed much, but I'll report back once I get the scoop. This place has no consideration for their neighbors at all. They have yelling patrons, dj's swearing, and very loud music that echoes off all the neighboring buildings. There are young kids living right across from their outdoor space. No amount of complaining to 311 helps and they don't answer their phone.